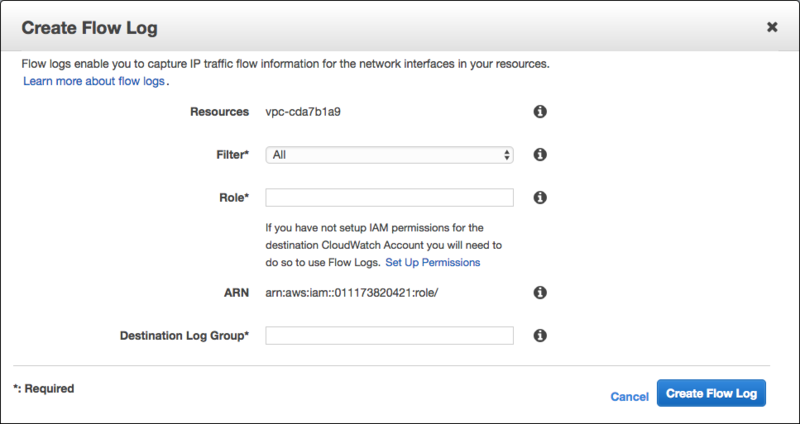 If you’re using AWS, CloudWatch is a powerful tool to have on your side. 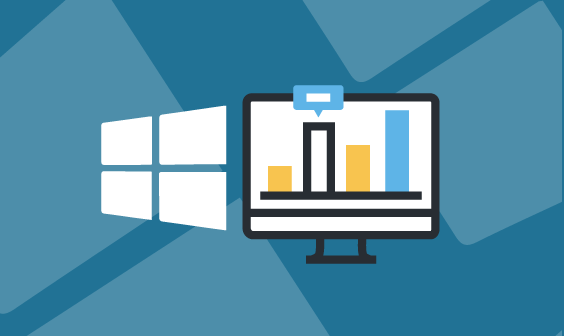 If used correctly, it will allow you to monitor how the different services on which your application relies are performing. 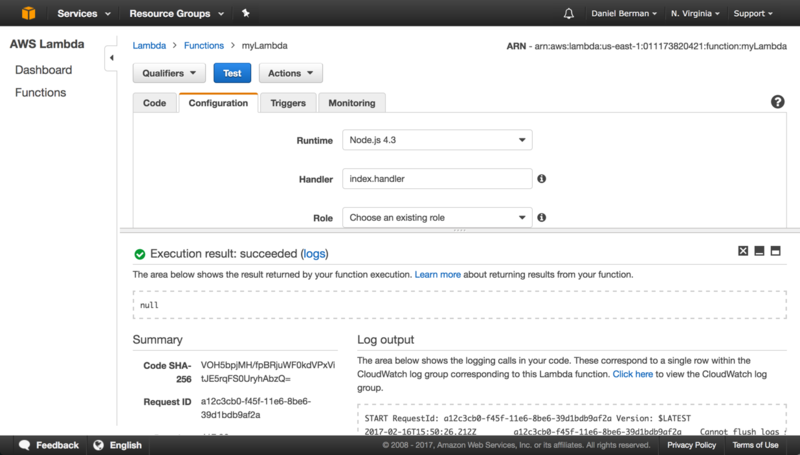 Setting it up is painless, with some of the services outputting logs to CloudWatch automatically. The challenge, of course, is getting the logs out of CloudWatch. 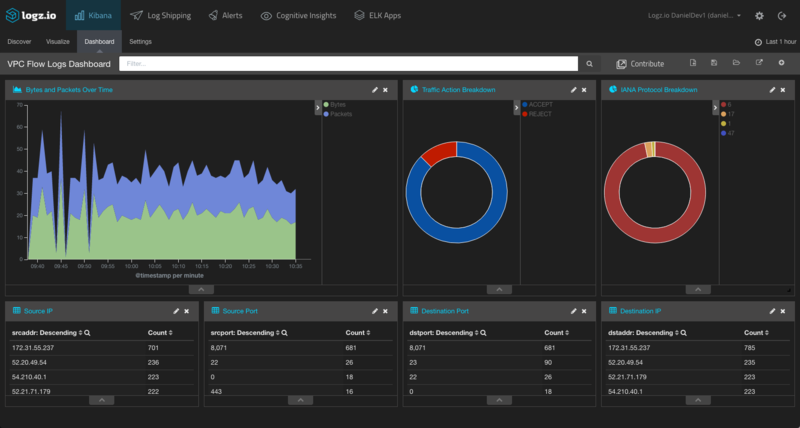 While the logs stored on CloudWatch can be searched either using the console or CLI, there is no easy way to properly visualize and analyze the data. 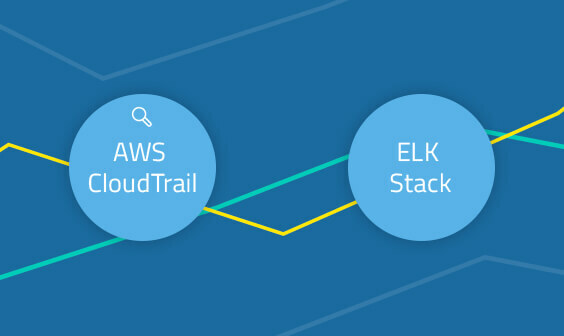 That’s why integrating CloudWatch with a third-party platform such as the ELK Stack makes sense. There are a few ways of building this integration. 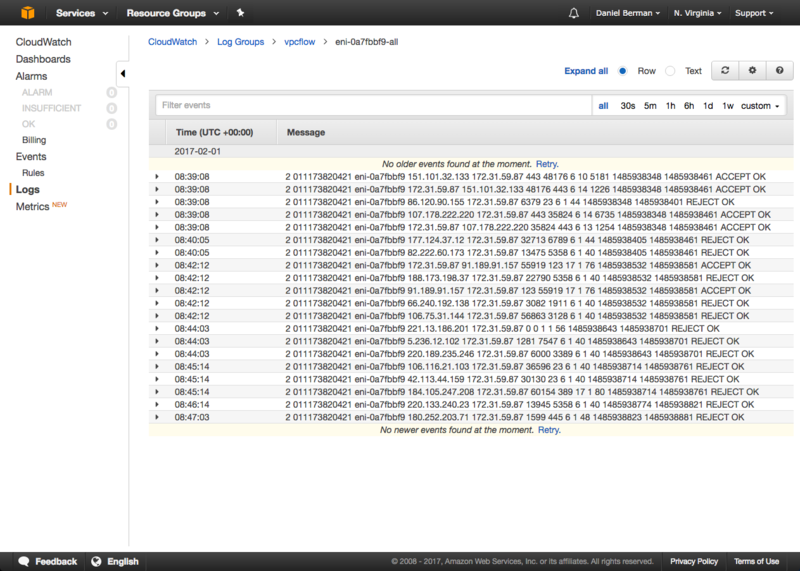 AWS added the option to batch export from CloudWatch to either S3 or AWS Elasticsearch. Batch is nice but not a viable option in the long run. Another option is to use Kinesis Firehose and a CloudWatch subscription filter to ship to S3 and from there into ELK using the Logstash S3 input plugin — or, if you are using Logz.io, with our built-in support for S3. It’s not exactly the most intuitive workflow, to say the least. 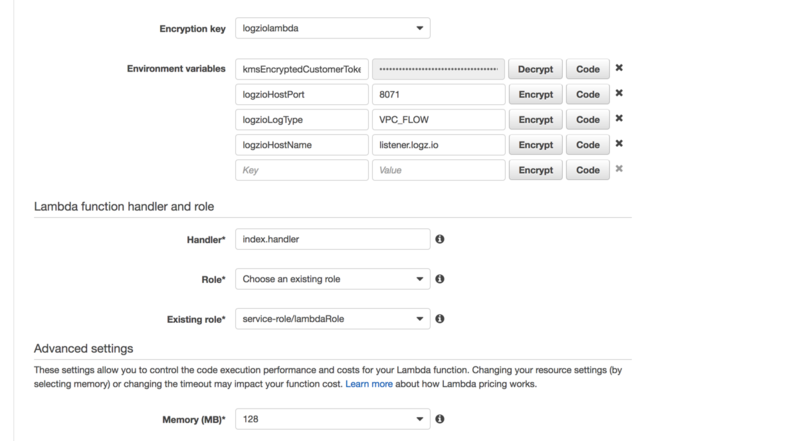 In this post, I’d like to explore another option — using a Lambda function to send logs directly from CloudWatch into the Logz.io ELK Stack. 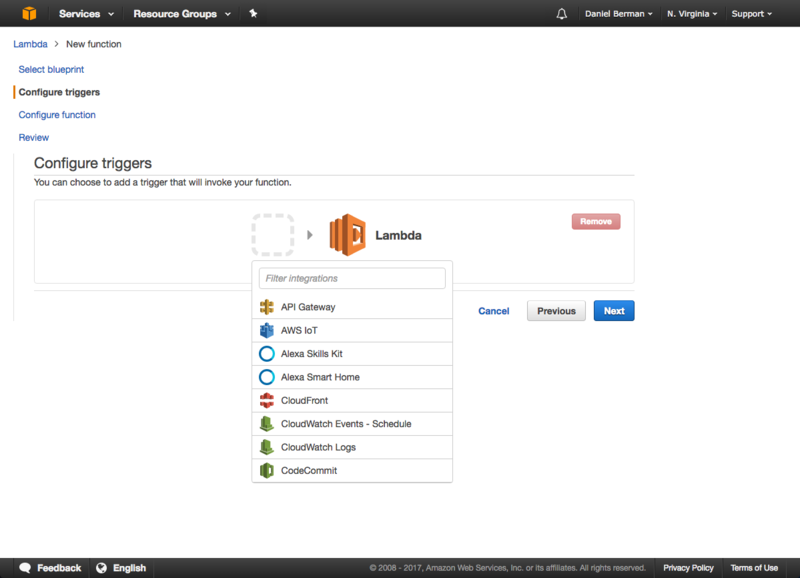 Please note that Lambda is not supported yet as a shipping method in Logz.io. The logs used for exploring this workflow were VPC Flow logs. 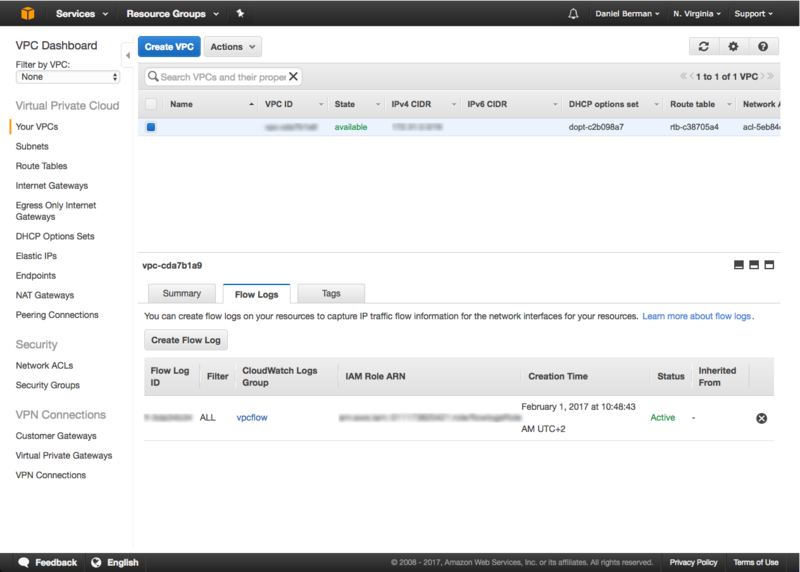 VPC Flow logs can be turned on for a specific VPC, a VPC subnet, or an Elastic Network Interface (ENI). Most common uses are around the operability of the VPC. You can visualize rejection rates to identify configuration issues or system misuses, correlate flow increases in traffic to load in other parts of systems, and verify that only specific sets of servers are being accessed and belong to the VPC. You can also make sure the right ports are being accessed from the right servers and receive alerts whenever certain ports are being accessed. Great. The first part is over. The next step is to create the Lambda function to ship into the Logz.io ELK. We will define an existing CloudWatch log group as the event that will trigger the function’s execution. 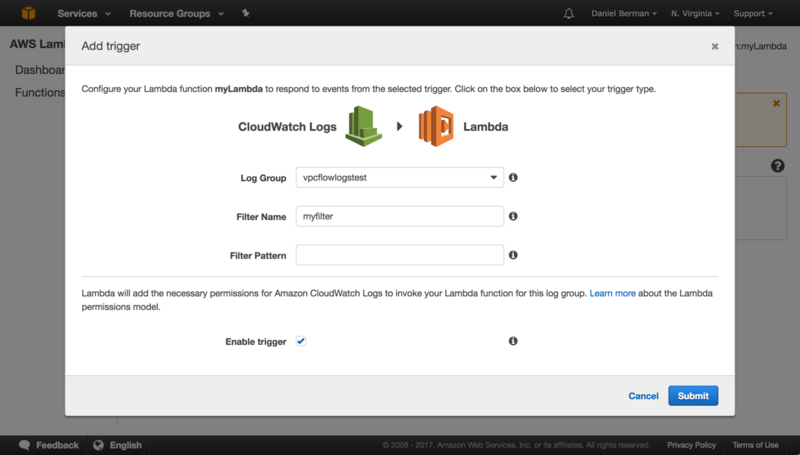 When asked to configure the trigger, select “CloudWatch Logs” and the relevant log group. When configuring your function in the next step, enter a name for the function and select “Node.js 4.3” as the runtime environment. Next, we need to define the environment variables used by the function — these will define the Logz.io token and endpoint URL. Since this information is sensitive, we are going to enable encryption helpers and use a pre-configured KMS key. Click “Encypt” for the first variable to hide the Logz.io user token. Next, select which IAM role you want to use. You can create a new one if you like, but if you are using an existing role, be sure that it has permissions to access CloudWatch logs. Continue on to the Review step. Make sure that all is correct and hit the “Create function” button. 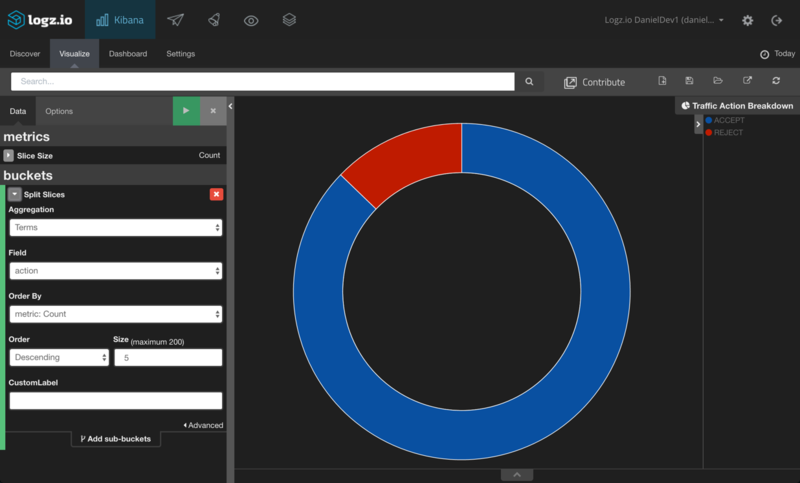 What’s left to do now is to build a dashboard that will help us to monitor the VPC Flow logs. To do this, we will build a series of visualizations for the data provided in the logs. 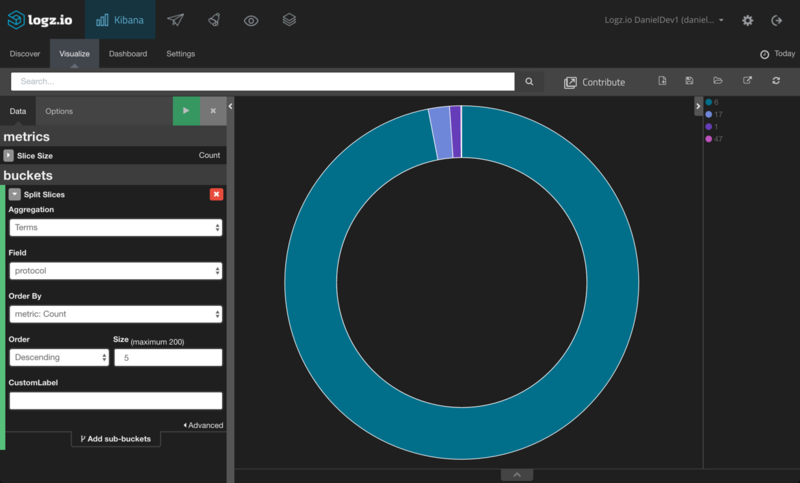 VPC Flow logs are a great source of information when trying to analyze and monitor IP traffic going to and from network interfaces in your VPC. 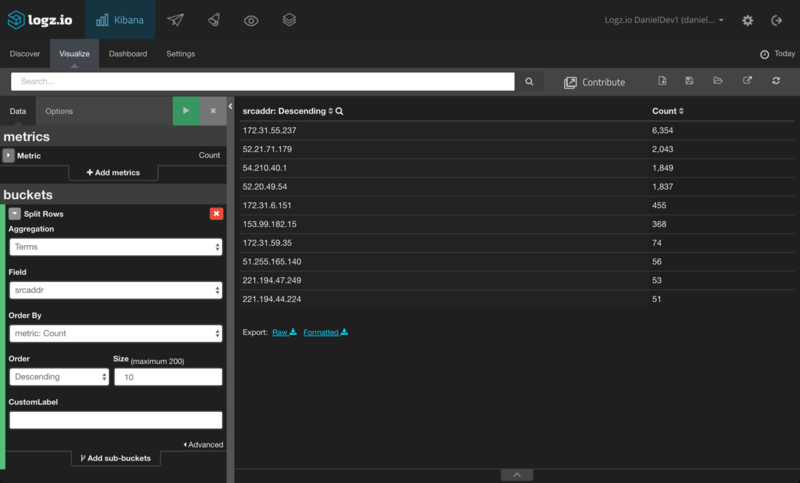 The logs can be used in security to monitor what traffic is reaching your instances and in troubleshooting to diagnose why specific traffic is not being routed properly. 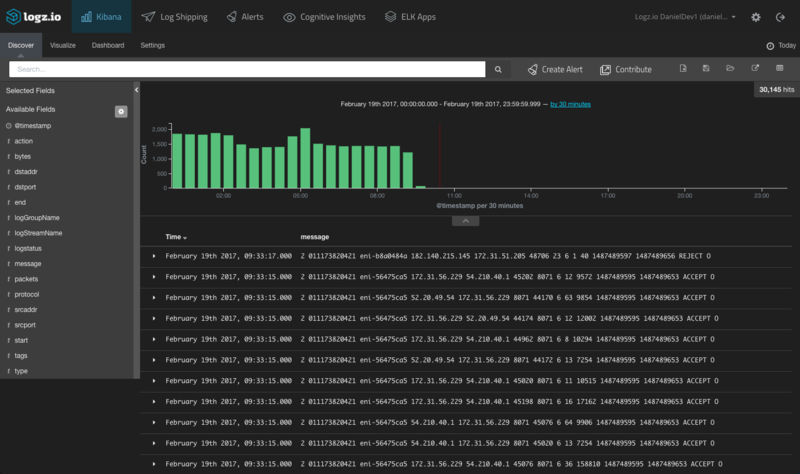 Using ELK helps you to make sense of all the traffic data being shipped into CloudWatch from your VPC console. 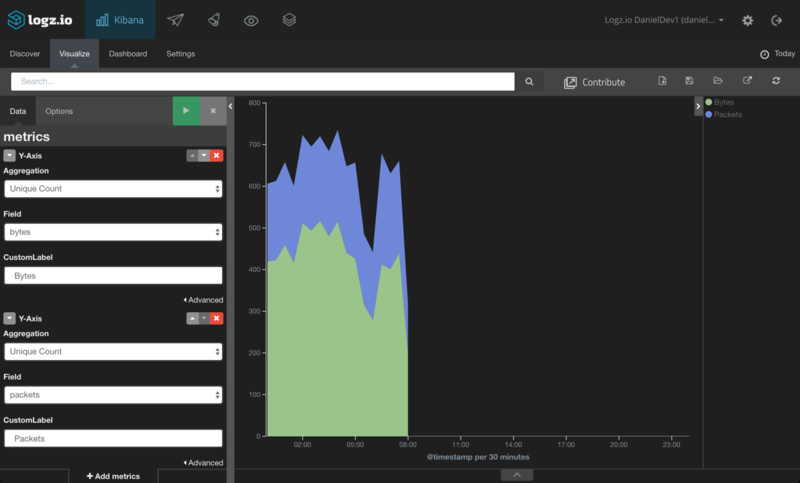 The dashboard shown above is available for download from ELK Apps — the Logz.io library of pre-made Kibana visualizations, alerts, and dashboards for various log types. Please note however that Lambda is not supported yes as a shipping method in Logz.io. 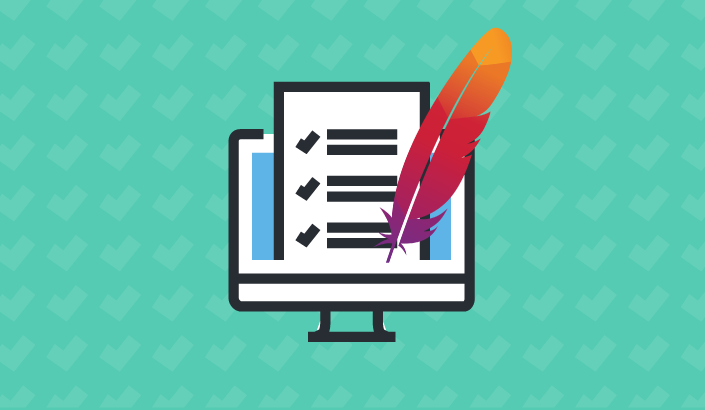 As mentioned in the introduction, there are other ways of streaming logs from CloudWatch into ELK — namely, using Kinesis Firehose and CloudWatch subscriptions. We will cover this method in a future post. 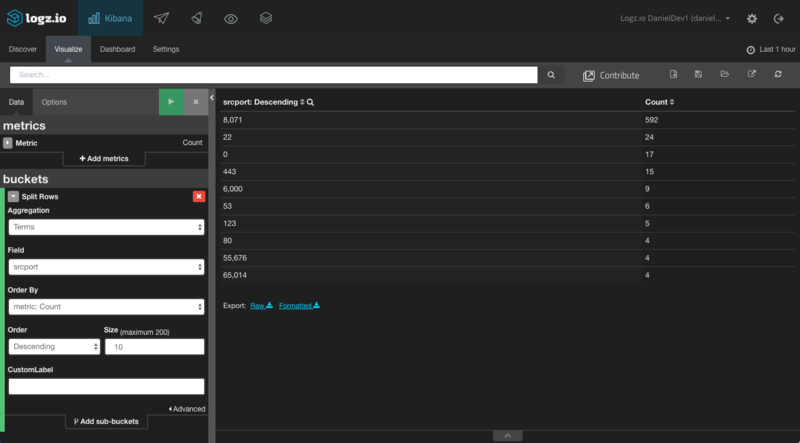 Start Logging with Logz.io Today!